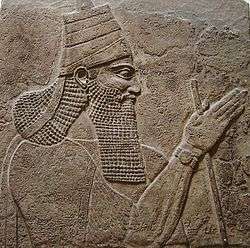 The list of Assyrian kings is compiled from the Assyrian King List, which begins approximately 2500 BCE and continues to the 8th century BCE. It begins listing Kings of the Sumero-Akkadian city-state of Assur, and later kings of the Assyrian Empires. Assyria is an ancient civilization in northern Mesopotamia (modern northern Iraq, northeastern Syria, and southeastern Turkey). The Assyrian King List includes regnal lengths that appear to have been based on now lost limmu lists (which list the names of eponymous officials for each year). These regnal lengths mostly accord well with Hittite, Babylonian and ancient Egyptian king lists and with the archaeological record, and are generally considered reliable for the age. It is somewhat fictional however, as some known kings are not found on the list and other listed kings are not independently verified. Prior to the discovery of cuneiform tablets listing ancient Assyrian kings, scholars before the 19th century only had access to two complete Assyrian King Lists, one found in Eusebius of Caesarea's Chronicle (c. 325 AD), of which two editions exist and secondly a list found in the Excerpta Latina Barbari. An incomplete list of 16 Assyrian kings was also preserved in the literature of Sextus Julius Africanus. Other very fragmentary Assyrian king lists have come down to us written by the Greeks and Romans such as Ctesias of Cnidus (c. 400 BC) and the Roman authors Castor of Rhodes (1st century BC) and Cephalion (1st century AD). Unlike the cuneiform tablets, the Greek-language list is only considered to contain minor historical truths. Some scholars argue further that they are either entire fabrications or fiction. There are three extant cuneiform tablet versions of the Assyrian King List, and two fragments. They date to the early first millennium BC — the oldest, List A (8th century BC) stopping at Tiglath-Pileser II (ca. 967–935 BC) and the youngest, List C, at Shalmaneser V (727–722 BC). Assyriologists believe the list was originally compiled to link Shamshi-Adad I (fl. ca. 1700 BC (short)), an Amorite who had conquered Assur, to the native rulers of the land of Assur. Scribes then copied the List and added to it over time. Before Erishum I the list gives no regnal lengths are given for kings. The following kings are listed from the list of cuneiform tablets. This section shows marked similarities to the ancestors of the first Babylonian dynasty. According to the Cambridge Ancient History, the conclusion of this section "marked the end of the nomadic period of the Assyrian people" and "visualized Ushpia as the actual founder of the Semitic city of Ashur"
Adamu fl. c. 2400 BC — c. 2375 BC (short) the earliest known use of the name “Adam” as a genuine name in historicity is Adamu. Apiashal fl. c. 2030 BC — c. 2027 BC (short) "son of Ushpia"
"altogether seventeen kings, tent dwellers." "kings who are ancestors/whose fathers are known"
Hale fl. c. 2027 BC — c. 2024 BC (short) "son of Apiashal"
Samani fl. c. 2024 BC — c. 2021 BC (short) "son of Hale"
Hayani fl. c. 2021 BC — c. 2018 BC (short) "son of Samani"
Ilu-Mer fl. c. 2018 BC — c. 2015 BC (short) "son of Hayani"
Yakmesi fl. c. 2015 BC — c. 2012 BC (short) "son of Ilu-Mer"
Yakmeni fl. c. 2012 BC — c. 2009 BC (short) "son of Yakmesi"
Yazkur-el fl. c. 2009 BC — c. 2006 BC (short) "son of Yakmeni"
Ila-kabkabu fl. c. 2006 BC — c. 2003 BC (short) "son of Yazkur-el"
Aminu fl. c. 2003 BC — c. 2000 BC (short) "son of Ila-kabkabu"
"altogether ten kings who are ancestors"
This section, which in contrast to the rest of the list, was written in reverse order, beginning with Aminu and ending with Apiashal, has often been interpreted as a list of Shamshi-Adad's ancestors. 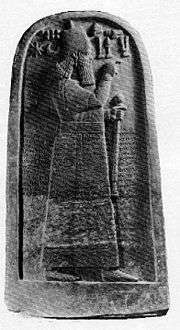 In keeping with this assumption, scholars have inferred that the original form of the Assyrian Kinglist was written, among other things, as an "attempt to justify that Shamshi-Adad was a legitimate ruler of the city-state Assur and to obscure his non-Assyrian antecedents by incorporating his ancestors into a native Assyrian genealogy". However, this interpretation was not accepted universally; the Cambridge Ancient History rejected this interpretation and instead interpreted the section as the ancestors of Sulili. "kings whose eponyms are not known"
These are early rulers of Assur. Sulili fl. c. 2000 BC (short) "son of Aminu"
Shalim-ahum fl. c. 1900 BC (short) "son of Puzur-Ashur I"
Ilu-shuma fl. c. 1945 BC — c. 1906 BC (short) "son of Shalim-ahum"
"altogether six kings (whose names were written on?) bricks whose eponyms are (not known?)." Damage to the tablets in all three extant King Lists before Enlil-nasir II (c. 1420–1415 BC (short)) prevents the calculation of approximate regnal dates from Erishum I to this point. Additionally, three kings attested elsewhere from this period are not included in the standard King List. The remainder of the King List then has an unbroken chain of regnal lengths from Enlil-nasir II on. Disparities between the different versions of the King List for the reigns of Ashur-nadin-apli (c. 1196–1194 BC (short)) and Ninurta-apal-Ekur (c. 1182–1180 BC (short)) contribute to the debate over the chronology of the ancient Near East. Ikunum fl. c. 1867 BC — c. 1860 BC (short) "son of Ilushuma"
Sargon I (damaged text) "son of Ikunum"
Puzur-Ashur II (damaged text) "son of Sargon (I)"
Naram-Suen (Naram-Sin) (damaged text) "son of Puzur-Ashur (II)"
Erishum II (damaged text) "son of Naram-Suen"
(33 years) "son of (local ruler) Ila-kabkabu, went to Karduniash in the time of Naram-Suen. In the eponymy of Ibni-Adad, Shamshi-Adad went up from Karduniash. He took Ekallatum, where he stayed three years. In the eponymy of Atamar-Ishtar, Shamshi-Adad went up from Ekallatum. He ousted Erishum (II), son of Naram-Suen, from the throne and took it. "; He was in turn conquered by Hammurabi of Babylon. Ishme-Dagan I (40 years) "son of Shamshi-Adad (I)"
Bel-bani (10 years) "son of Adasi"
Libaya (17 years) "son of Bel-bani"
Sharma-Adad I (12 years) "son of Libaya"
Iptar-Sin (12 years) "son of Sharma-Adad (I)"
Bazaya (28 years) "son of Iptar-Suen"
Lullaya (6 years) "son of a nobody"
Shu-Ninua (14 years) "son of Bazaya"
Sharma-Adad II (3 years) "son of Shu-Ninua"
Erishum III (13 years) "son of Shu-Ninua"
Shamshi-Adad II (6 years) "son of Erishum (III)"
Ishme-Dagan II (16 years) "son of Shamshi-Adad (II)"
Shamshi-Adad III (16 years) " son of (another) Ishme-Dagan, brother of Sharma-Adad (II), son of Shu-Ninua"
Ashur-nirari I (26 years) "son of Ishme-Dagan"
Enlil-nasir I (13 years) "son of Puzur-Ashur (III)"
Nur-ili (12 years) "son Enlil-nasir (I)"
Ashur-shaduni (1 month) "son of Nur-ili"
Ashur-rabi I (damaged text) "son of Enlil-nasir (I), ousted him (Ashur-shaduni), (and) seized the throne"
Ashur-nadin-ahhe I (damaged text) "son of Ashur-rabi (I)"
Enlil-nasir II c. 1420–1415 BC (short) "his (Ashur-nadin-ahhe I's) brother, ousted him"
Ashur-nirari II c. 1414–1408 BC (short) "son of Enlil-nasir (II)"
Ashur-bel-nisheshu c. 1407–1399 BC (short) "son of Ashur-nirari (II)"
Ashur-rim-nisheshu c. 1398–1391 BC (short) "son of Ashur-bel-nisheshu"
Ashur-nadin-ahhe II c. 1390–1381 BC (short) "son of Ashur-rim-nisheshu"
The dates up to Ninurta-apal-Ekur (c. 1182–1180 BC) are subject to debate, as some of the regnal lengths vary over the different versions of the King List. The dates given below are based on Assyrian King Lists B and C, which give only three years to Ashur-nadin-apli, and the same to Ninurta-apal-Ekur. (Assyrian King List A gives four years to Ashur-nadin-apli and 13 years to Ninurta-apal-Ekur.) This timeframe is also subject to the overall debate about the chronology of the ancient Near East; the short (or low) chronology is used here. 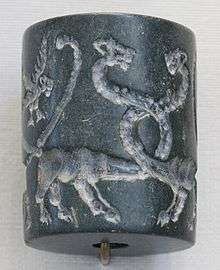 Dates from 1179 to 912 BC, although less secure than dates from 911 BC onwards, are not subject to the chronology debate. Eriba-Adad I c. 1380–1353 BC (short) "son of Ashur-bel-nisheshu"
Ashur-uballit I c. 1353–1318 BC (short) "son of Eriba-Adad (I)"
Enlil-nirari c. 1317–1308 BC (short) "son of Ashur-uballit"
Arik-den-ili c. 1307–1296 BC (short) "son of Enlil-nirari"
Adad-nirari I c. 1295–1264 BC (short) "son of Arik-den-ili"
Shalmaneser I c. 1263–1234 BC (short) "son of Adad-nirari (I)"
Tukulti-Ninurta I c. 1233–1197 BC (short) "son of Shalmaneser (I)"
Ashur-nadin-apli c. 1196–1194 BC (short) "during the lifetime of Tukulti-ninurta (I), Ashur-nadin-apli, his son, seized the throne"
Ashur-nirari III c. 1193–1188 BC (short) "son of Ashur-nadin-apli"
Enlil-kudurri-usur c. 1187–1183 BC (short) "son of Tukulti-Ninurta (I)"
Ninurta-apal-Ekur c. 1182–1180 BC (short) "son of Ila-Hadda, a descendant of Eriba-Adad (I), went to Karduniash. He came up from Karduniash (and) seized the throne." Beginning with Ashur-Dan I, dates are consistent and not subject to middle/short chronology distinctions. Ashur-Dan I c. 1179–1133 BC "son of Ashur-nadin-apli"
Ninurta-tukulti-Ashur c. 1133 BC "son of Ashur-dan (I), briefly"
Mutakkil-nusku c. 1133 BC "his (Ninurta-tukulti-Ashur's) brother, fought him and took him to Karduniash. Mutakkil-Nusku held the throne briefly, then died." Ashur-resh-ishi I c. 1133–1115 BC "son of Mutakkil-Nusku"
Tiglath-Pileser I c. 1115–1076 BC "son of Ashur-resh-ishi (I)"
Asharid-apal-Ekur c. 1076–1074 BC "son of Tiglath-pileser (I)"
Ashur-bel-kala c. 1074–1056 BC "son of Tiglath-pileser (I)"
Eriba-Adad II c. 1056–1054 BC "son of Ashur-bel-kala"
Shamshi-Adad IV c. 1054–1050 BC "son of Tiglath-pileser (I), came up from Karduniash. He ousted Eriba-Adad (II), son of Ashur-bel-kala, (and) seized the throne"
Ashur-nasir-pal I c. 1050–1031 BC "son of Shamshi-Adad (IV)"
Shalmaneser II c. 1031–1019 BC "son of Ashur-nasir-pal (I)"
Ashur-nirari IV c. 1019–1013 BC "son of Shalmaneser (II)"
Ashur-rabi II c. 1013–972 BC "son of Ashur-nasir-pal (I)"
Ashur-resh-ishi II c. 972–967 BC "son of Ashur-rabi (II)"
Tiglath-Pileser II c. 967–935 BC "son of Ashur-resh-ishi (II)"
Ashur-Dan II c. 935–912 BC "son of Tiglath-Pileser (II)"
Synchronisms between the limmu lists and absolute dates known from Babylonian chronology provide good absolute dates for the years between 911 BC and 649 BC. The dates for the very end of the Assyrian period are uncertain due to the lack of limmu lists after 649 BC. Some sources list Ashurbanipal's death in 631 BC, rather than 627 BC; Ashur-etil-ilani then reigns from 631 to 627, and Sin-shar-ishkun reigns until 612 BC, when he is known to have died in the sack of Nineveh. Adad-nirari II 912–891 BC "son of Ashur-Dan (II)"
Tukulti-Ninurta II 891–884 BC "son of Adad-nirari (II)"
Ashur-nasir-pal II 884–859 BC "son of Tukulti-Ninurta (II)"
Shalmaneser III 859–824 BC "son of Ashur-nasir-pal (II)"
Shamshi-Adad V 824–811 BC "son of Shalmaneser (III)"
Adad-nirari III 811–783 BC "son of Shamshi-Adad (V)"
Shalmaneser IV 783–773 BC "son of Adad-nirari (III)"
Ashur-nirari V 755–745 BC "son of Adad-nirari (III)"
Tiglath-Pileser III 745–727 BC "son of Ashur-nirari (V)"
Shalmaneser V 727–722 BC "son of Tiglath-Pileser (III)"
End of the document known as Assyrian King List; the following kings reigned after the list had been composed. The dates of the last kings are not certain. In 612 BC, Nineveh, the Assyrian capital, fell to the Medes, Babylonians, and Scythians; supported by the Egyptians, an Assyrian general continued to rule for a few years from Harran. Ctesias, as court physician to Artaxerxes II, claimed to have access to the royal historical records. Ctesias' list of Assyrian kings was included in his Persica, a work covering the history of Persia, but the first 3 books were dedicated to pre-Persian Assyria entitled "The History of the Assyrians". How much of Ctesias' king list is factual history is still debated. While most scholars agree large parts are fiction, it is generally agreed that there is historical truth based on the probability his list was rooted in transmitted oral tradition. Classical scholar Robert Drews, however, has argued that Ctesias' list contains information from Babylonian tablets. Although Ctesias's entire work is lost, fragments of it are found preserved in Diodorus Siculus, Nicolaus of Damascus and Photius. From these fragments it is known Ctesias dated the founding of the Assyria to c. 2166 BC, by King Ninus, husband of Queen Semiramis, and 30 further Assyrian kings followed for 1300 years in succession to Sardanapalus (c. 866 BC). Ctesias' list of 30 successors from Ninus (and Semiramis) to Sardanapalus is lost. In the 1st century BC, Castor of Rhodes compiled an Assyrian king list, similar to that of Ctesias'. Fragments only remain in mutilated form, but it is known from these fragments that Castor's Assyrian king list started with Belus, and, like Ctesias', included Ninus, also said to be the husband of Semiramis. However, Ninus equates in Castor's list to the second king, not the first and is said to have ruled for 52 years. Castor further dated Belus to 2123 BC. A fragment from Cephalion names Ninus' successor to be Ninyas, his son. A final list is found in the Excerpta Latina Barbari. The list can be found in Scaliger's Thesaurus temporum (1606). The list dates Belus, the first Assyrian king, to c. 2206 BC. The Arab historian al-Ya'qūbī included in his Kitāb al-ta'rīkh written in 873 CE a list of kings of "Mosul and Nineveh" comprising three identifiable Assyrian kings and a queen: Palūs/Tiglath-pileser II (965-936), Ninūs/Tukulti-Ninurta II (890-884), Lāwasnasir/Assurnasirpal II (883-859) and Shamīram/Semiramis (810-806). semiramis 760 bc wife of pul. tigleth-pileser 747 bc brother of nabonassar. sennacherib 719 bc war with egypt-ethiopia. chinyladdon 689 bc nabuchodonosor, war with medes, the temple raids. ↑ Rowton, M.B. (1970). The Cambridge Ancient History. 1.1. Cambridge University Press. pp. 194–195. ISBN 0521070511. ↑ One the standard, the other a later Armenian translation. ↑ For discussion of king lists, see Poebel, “Assyrian King List,” 71–90; IJ Gelb, “Two Assyrian King Lists,”Journal of Near Eastern Studies 13 (1954): 209–30. 1 2 3 4 5 6 Meissner, Bruno (1990). Reallexikon der Assyriologie. 6. Berlin: Walter de Gruyter. pp. 101–102. ISBN 3110100517. ↑ Hamilton, Victor (1995). The Book of Genesis, Chapters 1 - 17. Wm. B. Eerdmans Publishing. ISBN 9780802825216. 1 2 3 4 5 Rowton, M.B. (1970). The Cambridge Ancient History. 1.1. Cambridge University Press. pp. 202–204. ISBN 0521070511. 1 2 3 Glassner, Jean-Jacques (2004). Mesopotamian Chronicles. Society of Biblical Literature. p. 137. ISBN 1589830903. ↑ Meissner, Bruno (1990). Reallexikon der Assyriologie. 6. Berlin: Walter de Gruyter. p. 104. ISBN 3110100517. ↑ J. A. Brinkman (2001). "Assyria". In Bruce Manning Metzger, Michael David Coogan. The Oxford companion to the Bible. Oxford University Press. p. 63. ↑ Meissner, Bruno (1990). Reallexikon der Assyriologie. 6. Berlin: Walter de Gruyter. p. 105. ISBN 3110100517. ↑ Rowton, M.B. (1970). The Cambridge Ancient History. 1.1. Cambridge University Press. p. 195. ISBN 0521070511. 1 2 3 4 Glassner, Jean-Jacques (2004). Mesopotamian Chronicles. Society of Biblical Literature. pp. 136–144. ISBN 1589830903. 1 2 3 4 Lendering, Jona (31 March 2006). "Assyrian King List". Retrieved 2008-08-13. 1 2 3 Glassner, Jean-Jacques (2004). Mesopotamian Chronicles. Society of Biblical Literature. p. 88. ISBN 1589830903. ↑ For variants, see footnotes 49–56 in Glassner, Jean-Jacques (2004). Mesopotamian Chronicles. Society of Biblical Literature. p. 155. ISBN 1589830903. ↑ Bedford, P. (2001). "Empires and Exploitation: The Neo-Assyrian Empire" (PDF). WA Perth. ↑ "Ctesias' Persian History: Introduction, text, and translation", Jan P. Stronk, Wellem Verlag, 2010, pp.30-36. ↑ Felix Jacoby cf. FGrH 688 T 11, T 13, T 19, shows ancient authorities that considered the king list to be sensational, semi-fictional or unrealistic at the time. ↑ Drews, 1965, p. 30. ↑ "Ovid, Varro, and Castor of Rhodes: The Chronological Architecture of the 'Metamorphoses'", Thomas Cole, Harvard Studies in Classical Philology, Vol. 102, (2004), pp. 355-422. ↑ Preserved by George Syncellus, found in Cory's Ancient Fragments, 1826, p. 70. ↑ The Assyrian King list in the Excerpta Latina Barbari claims Belus ruled 1430 years before the first Olympiad (776 BC) thus dating him to 2206 BC. ↑ Dierk Lange, The founding of Kanem by Assyrian Refugees ca. 600 BCE: Documentary, Linguistic, and Archaeological Evidence, Boston, 2011, p. 29. ↑ Abū al-Rayhān Muhammad ibn Ahmad al-Bīrūnī الآثار الباقية عن القرون الخالية-vestiges of the past. pp. 194–195. Ascalone, Enrico (2007). Mesopotamia: Assyrians, Sumerians, Babylonians (Dictionaries of Civilizations; 1). Berkeley: University of California Press. ISBN 0520252667. Grayson, Albert Kirk (1975). Assyrian and Babylonian Chronicles. Locust Valley, N.Y.
Healy, Mark (1992). The Ancient Assyrians. ISBN 978-1-85532-163-2. Leick, Gwendolyn (2003). Mesopotamia. ISBN 0140265740. Lloyd, Seton (1984). The Archaeology of Mesopotamia: From the Old Stone Age to the Persian Conquest. ISBN 0500790094. Nardon, Don (1998). 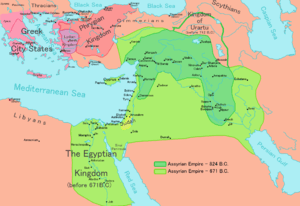 Assyrian Empire. ISBN 1560063130.